There should be more to follow, once I've scanned them. Throughout June and August we had a photography competition at work, which meant that each person got to take the office digital SLR home for the night, hopefully to return afterwards with suitable submission of their choosing. When it came to my turn, although I'd had a few rather predicable ideas of what to photograph, I realised that it was the opportunity to capture what Claire and I had spectacularly failed to even notice at the end of October last year, when we walked the length of the former LNER and would-be Northern line trackbed between Finsbury Park and Alexandra Palace, now the Parkland Walk nature reserve. 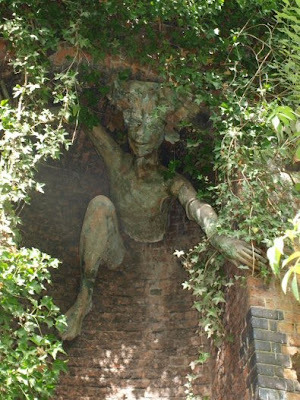 Once you actually know it's there, Marilyn Collins's Spriggan sculpture - in one of the arches of a retaining wall next to the former Crouch End station - is impressively obvious, but because we weren't aware of it at the time... er... we didn't! Luckily my turn to use the camera came on a Friday, so I had the whole weekend to trek over to Crouch End, but unfortunately, when printed out and stuck on the office wall for the competition, it became clear that I'd perhaps been a bit too subtle, as most people thought I'd just taken a picture of a graffiti-covered wall. Maybe I should have used this one, then I might have made the short-list, let alone actually won! 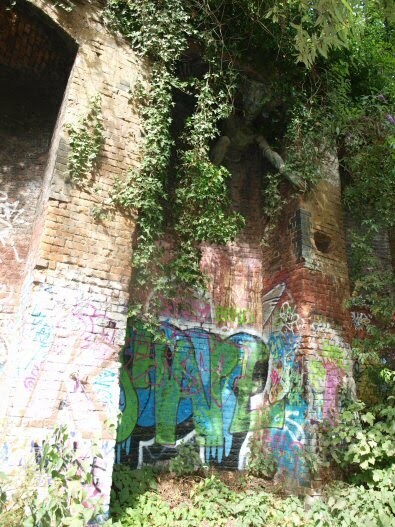 More pictures of the former station site can be found on my Hidden City page here. A recent edition of the Metro free newspaper included a feature on Andrew Emmerson's new book on the London Underground (imaginatively titled The London Underground, and published by Shire Library), which placed much emphasis on what it described as the "little known secrets" of the network, although the ones they chose to highlight seemed familiar enough to me. Accompanying the print version of the article was a much-previously published - although no less dramatic - photograph of the extensive damage cause to Sloane Square station when it was hit by a German bomb during the Second World War, with the caption stating that 79 people were killed in the attack. Wartime papers held at the National Archives show that at 21:15 on 12 November 1940, a high-explosive bomb struck the ticket hall of the station, demolishing much of the canopy roof, and completely blocking the line with debris. One large chunk of concrete landed on top of a train that was just leaving the station, and two gas mains were also severed and ignited. Initial reports were that there were over 40 fatalities, yet for many years only ambiguous references to "79 casualties" were applied to the incident in various sources, such as Piers Connor's history of the District line. In fact, an analysis of the Register of Civilian War Dead maintained by the Commonwealth War Graves Commission reveals 37 named fatalities attributed to the incident. Thirty-five of them appear to be been killed immediately or died at the station, with the remaining two dying of their injured later in hospital. This makes it the third highest loss of life on the Underground due to direct enemy action, after the bombings of Balham (66 dead) and Bank (57 dead) in Octiber 1940 and January 1941 respectively. "Among the sites visited [by reporters] yesterday was an Underground station, the entrance offices and roof of which were shattered by a heavy bomb. Members of the R.E. were dislodging perilously hanging blocks of masonry and detatching others from steel girders by the use of electric drills, while gangs of the Pioneer Corps shovelled the debris into trucks for removal."